Today I am going to talk about the Cisco Firepower 9300 series which is one of the most powerful box by Cisco systems. Cisco Firepower 9300 is a Next Generation Firewall and has various capabilities of AVC, IPS, AMP and URL filtering with the high throughput value. In this article, I will only talk about Cisco 9300 Firepower next generation firewalls. Although you can have two different images in the box. You can use ASA image or NGFW image in all these 3 boxes as per the requirement in your network. Cisco Firepower 9300 is a highly scalable with carrier-grade, modular platform designed for service providers, high-performance computing centres, large data centres, campuses, high-frequency trading environments, and other environments that require low (less than 5-microsecond offload) latency and exceptional throughput. 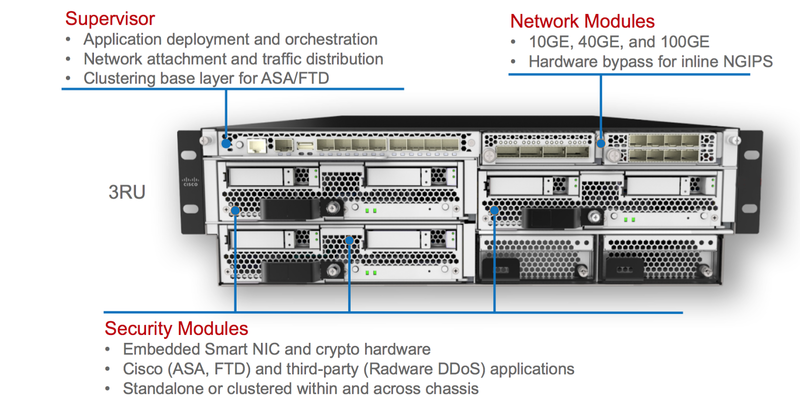 Cisco Firepower 9300 supports flow-offloading, programmatic orchestration, and the management of security services with RESTful APIs. It is also available in Network Equipment Building Standards (NEBS)-compliant configurations. Let's talk about the hardware of Cisco Firepower 9300 which includes Network modules, Security modules and the interfaces supported in the Cisco Firepower 9300. It can support 2 Network module with supervisor engines and 3 Security module. Subscribe us on Youtube: Youtube Subscription for Videos !